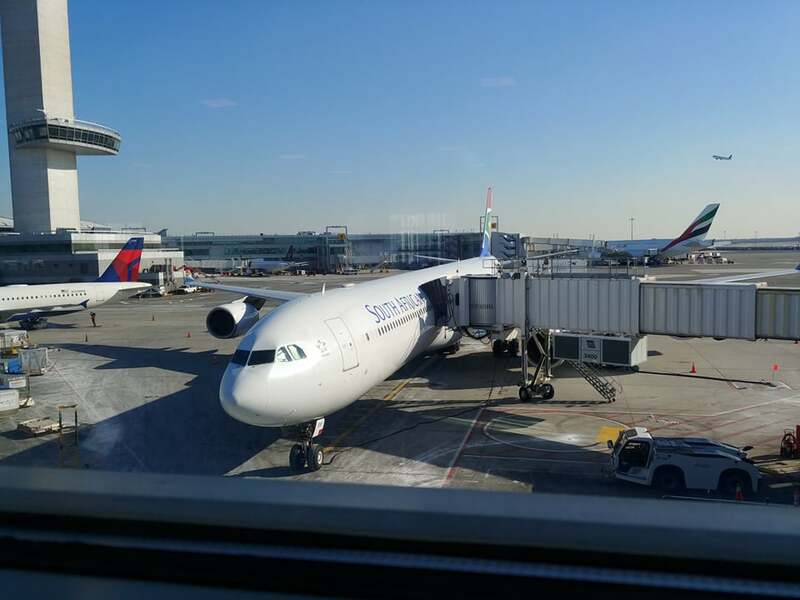 We arose early on Monday, March 4, 2019, for final packing and preparations for our flight to New York City (actually JFK Airport located in Jamaica, NY). Our friend and Lyft driver Greg picked us at our home at 10:10 a.m. Arriving at the airport, my husband Bill and I checked our two pieces of luggage at the outdoor check-in desk, went easily through Pre-check security with our two pieces of carry-on luggage, and headed to our gate. The Delta flight #631 left at 1:40 p.m. and landed smoothly and safely at 3:30 p.m.
Two minor problems occurred the rest of the day. First it took the free Hampton Inn shuttle an hour to pick us up even though I called the hotel immediately after we reached Federal Circle via the JFK Air train we took to get there. It was cold and windy, but most of the snow that had fallen on Sunday had melted. We were thankful for that. We were only wearing light jackets and sweaters so by the time we were dropped off at the hotel, we were chilled to the bones. Being southerners from Georgia, our bodies do not adapt to cold weather easily. After checking into our room, we discovered our sink was stopped up and would not drain properly. It took two attempts from the helpful hotel handyman to resolve this problem. Our hotel shared a lovely restaurant with the Hilton Hotel next door. A long hallway connected us to the restaurant so we did not have to go back out into the cold night. Dinner was fabulous—veal for me and a seafood platter for Bill. It was a relaxing evening after a busy travel day. We slept around 10:00 p.m. The first leg of our journey was completed—the easy part was over. At 7:00 a.m. the following morning we took the hotel shuttle to JFK to catch our South African flight #204 to Johannesburg, South Africa. Once again security was easy and quick. Our flight was scheduled to leave at 10:40 a.m. but did not take off until 11:40 a.m. We sat on the plane for 90 minutes waiting to leave. To quote the pilot, “We are sorry for the long delay, but our plane computers seem to be fighting with each other. We must resolve this situation.” As someone who dreads flying, this was not what I wanted to hear. In the air at last, we were pleased to discover the leg room in our seated area was not as cramped as in some airlines. However, the air conditioning and ventilation systems were horrendous. For the entire 15-hour flight we suffered in this huge metal sauna. I was literally soaked most of the flight and got a nasty headache. An acceptable lunch was served at 2:30 p.m. EST. (I had not yet changed the time on my watch to the local time somewhere over the Atlantic Ocean.) After our trays were collected, the situation continued to get worse. We were thrust into darkness. All the lights in the plane were turned off. I had planned to read, work on some puzzles I had brought, and write in my journal. The small overhead light above my seat I turned on was not adequate for my eyes to be able to see without straining them. The previously helpful, efficient flight attendants miraculously disappeared. We sat in the darkness for the next 8 hours without any more food, drinks, etc. We were miserable. My legs were hurting. Bill was not feeling well. We had both been sick with an intestinal virus days before the trip. Poor Bill was having a relapse from dehydration and lack of food. Ninety minutes before landing, the lights popped on, the staff suddenly reappeared, and breakfast was served. By this time many passengers were not feeling well and were upset. I had not slept so I was also exhausted. I rarely can sleep on a plane in the best circumstances. This flight was now in the top five of one of my worst plane experiences. It was 8:45 a.m. (South African time) when our wheels touched down—one hour late. I was now limping in pain. A kind airport employee spotted us and insisted on wheeling me through baggage pick-up, immigration, and luggage re-check for our next flight to Cape Town. Bill was now extremely ill and had to make an emergency dash to the airport restroom after we got our checked luggage and went through immigration. The helpful employee even went back to check on Bill at the restroom. We needed to be at the gate in 15 minutes for our 10:15 a.m. flight. The airport was not huge but a little confusing to locate the right domestic terminal. The layout is rather unusual. We went up the escalators, walked for what seemed like an eternity, then rode down several escalators, and finally reached the gate. I hate hurrying through airports so I was not happy. 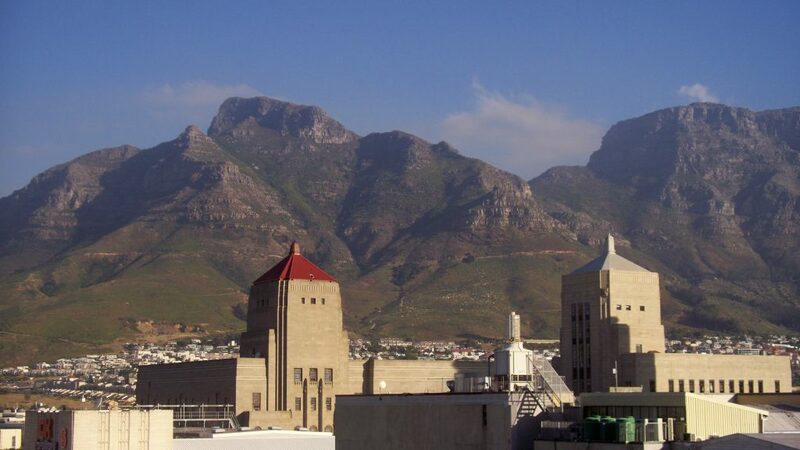 South African Flight #323 landed in Cape Town two hours later after leaving on time. Waiting for us after we picked up our luggage was our guide Ron McGregor dressed in safari-type attire and a hat that resembled that of Indiana Jones. He was a welcome sight to all 40 people on our tour now gathered together for the first time. 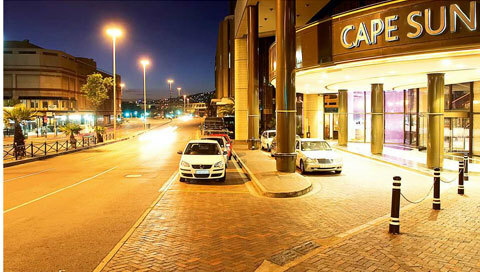 Since we were exhausted, the twenty-minute bus ride to Cape Sun Hotel in downtown Cape Town seemed like an eternity. After our mango welcome drink, we headed to our room in this luxurious hotel. The view from our room highlighted a magnificent landscape of the famous Tabletop Mountain. This would be the only day to see the mountain this clearly. The porter brought our luggage to our room within 15 minutes, and we happily “crashed” on our comfy beds for a three hour much needed nap. At 7:00 p.m. we met Ron and our group in the hotel restaurant near the lobby for our welcome buffet dinner and a meeting with Ron on our agenda while in Cape Town. The food was superb, and the service was excellent. We also interacted a little with some of the other members of the tour group. Most people were too tired so after dinner, everyone scurried off to their rooms. We had flown over 9600 miles since leaving Atlanta, Georgia, but we were safely here. Our next day would be an early rise again. Bill was still sick but also exhausted so he had no problem sleeping that night. I fell asleep as soon as my head hit the pile of pillows on the bed.